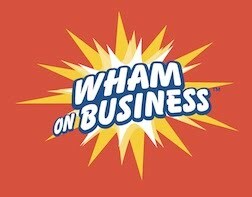 Wham on Business: Resign Accounts? Yes, you read the title of this blog correctly. You may need to resign some of your accounts. Why would that make sense? Due to the simple reason that certain accounts may cost you more than they are worth. 1) Outside sales force. Outside sales reps may be spending their time on small accounts when they should be spending their time on accounts that are potentially far more profitable to your company. But, if you try to limit the size of accounts that the sales reps can bring in, you’ll receive resistance. Sales reps will generally go to points of least resistance and oftentimes small accounts are easier to crack than larger accounts. I faced this issue with one of my companies. When I finally bit the bullet and resigned over 30% of my company’s accounts and refused to accept new business that didn’t rise to a certain level, there was wailing and gnashing of teeth from my sales reps. However, that situation turned around within 2 months and my company’s profitability soared and my sales reps made dramatically more commissions. 2) Customer service. Customers cost money to service and generally that service cost is hard to price accurately. For example, you have employee costs, equipment costs like phones, desks, computers, etc., you have rental space costs for those incremental employees plus perhaps additional warehouse space, and finally you have managerial/supervisory costs. When you accurately add everything up, you’ll get a fair assessment as to the real customer service costs for each of your customers. 3) Strategic direction misapplication. You are President of your company. That title mandates that you, in conjunction with your senior staff, have to set the strategic direction of your company. If you’ve got numerous small accounts, no matter how you would like otherwise, you’re going to be sucked into spending time on those accounts. You’ll be involved with decisions about management, space, equipment, etc. Any strategic misapplication of your time means you’ll be spending less time on those strategic issues that have a more meaningful impact on the success of your company. So, the upshot of this blog is look carefully at your accounts and make certain you are accurately assessing their costs. If you decide they are costing more than they are worth, then step up and resign them in a professional, well thought process. After you’ve made this difficult decision watch you revenues and profitability grow. And, isn’t that why you’re in business?